Apricot, the golden orange colored delicious fruits known for the velvety texture of their skin and flesh. Besides apricot pulp, apricot seed is also edible. Apricot's seed which is a nut and just like other nuts it is rich in protein and fat. Although the apricot nut is edible but avoid too much consumption and don't eat if it is bitter in taste. Apricots are found in summer season with lots of health benefits. They are consumed both fresh and in dried form as well. Ripe apricots have sweet flavor similar to plums while sun dried apricots have concentrated nutrient levels than fresh ones although they are lesser in vitamin-C content.Vitamin C improve immune system and helps body develop resistance against infectious agents and scavenge harmful oxygen free radicals. Apricots are rich source of Vitamin A and carotenes. Both of these nutrients are known to have antioxidant properties and are essential for vision and healthy skin. Along with other benefits, it is very helpful for people on diet. It is extremely low in calories and almost fat free. Apricots are rich in Vitamin A which prevents cataract and macular degeneration. Apricots are high in vitamins A and C, and are also rich in beta carotene, fiber and potassium. All these nutrients are essential to prevent cataracts. According to recent research, You can lower Your Risk of Cataracts by 40% with Apricots. Apricot is rich in vitamins A, C and E as well as carotenoids that reduce the risk of eye vision problems and improve eye vision. Anti oxidants in apricot fight against free radicals. Free radical damage can injure the eyes' lenses. In addition, eating 3-4 servings of apricot fruit per day may lower your risk of age-related macular degeneration (ARMD). Apricots contain high amount of pectin and cellulose which act as a mild laxative, thus helping in getting rid of constipation. Apricots are high in fiber which is vital for colon health and prevents constipation that might cause colon cancer. Apricot is generally recommended to patients who regularly suffer from constipation problem. Gallstones are made up of calcium salts, cholesterol and bile pigments. They can develop in the bile ducts or gallbladder and make it difficult to digest fatty foods. Recent scientific research indicates that apricot help in dissolving and removal of gall stones. Instead of fresh, dried apricots are preferred in getting rid of gall stones. Apricots are good source of dietary fiber. These fibers increase metabolism which improves digestion. Apricots are very helpful in getting rid of many kinds of digestion problems and is very beneficial for detoxifying the body. It also helps in elimination of waste products from the body. Apricot is a rich source of iron that plays an important role in the formation of blood. , thus improving blood flow and energy flow. Deficiency of iron can cause anaemia. Besides, apricot also contains small amounts of copper that enables the body to absorb iron. Apricots are very beneficial for pregnant women as they contain vitamins A, C and E as well as minerals like phosphorus, silicon, calcium, iron and potassium. Pregnant women are often advised to consume dried apricots as they have a high iron content which is important for pregnant women to prevent anemia. Apricots are very high in vitamin C which helps to boost your immune system and thus protect you from cold and many infection caused by various infectious agents. Apricot oil contains vitamins A and E which support skin health and repair. Thus, it is a great home remedy for problems like dry scalp, eczema and psoriasis, dandruff . This oil restores moisture to dry or flaky scalp. Apricot oil is packed with oleic and linoleic acids which help a lot to cure many hair problems. Its high content of vitamins A and E makes it great for hydration and conditioning. For extra softness and shine you can add some apricot oil in your shampoo or conditioner. Apricots contain a good amount of calcium which is vital for the formation and development of bones. Thus, eating apricots helps in maintaining bone health and prevents bone related problems like osteoporosis. The powerful antioxidants found in apricots help protect the body from free radical activity and damage to cells and DNA. Thus prevents from various forms of cancers. Apricots reduce the risk of cardio vascular disease as they are rich in antioxidants like Vitamin C and lycopene. These antioxidants reduce LDL(bad) cholesterol, thus minimizing the risk of heart attack and cardiovascular diseases. Muscle cramps occur when you are mineral deficient. Apricots contain a good amount of potassium which can help to prevent muscle cramping. Both fresh and dried apricots are low in calorie that is 50 calories per hundred grams of fruit. To lose weight it is also more effective. These are also free from fat with large amount of nutrition contents. So it offers healthy food with more nutritional benefits for your body. Apricot is low in calorie so the chance of gaining weight is very low, plus it has fiber that makes you feel less hungry and that also results less eating. So eat apricot without worrying about gaining weight. Apricots contain a good amount of Anti oxidants that fight against skin damaging free radicals and slow down aging process. Daily consumption of apricot is highly beneficial in delaying aging process. Apricot oil is very beneficial for body massage and keeps skin glowing and healthy. Skin diseases like scabies, eczema and itching can be cured with the help of this oil. 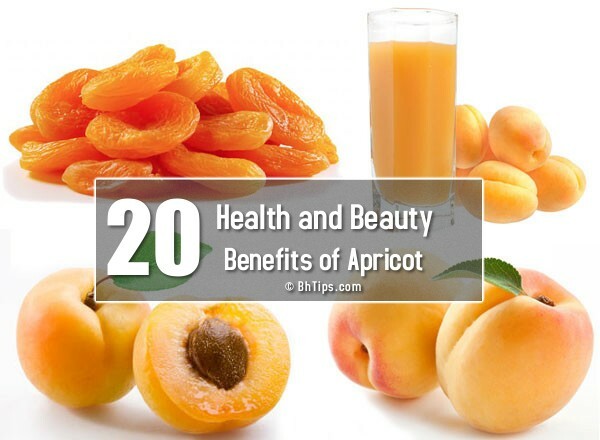 With immense skin benefits apricots help a lot to cure wrinkles. Apricot pulp is used in various skin masks to cure skin wrinkles at home. Apricot scrubs help a lot to remove dead skin cells and give you healthy glowing and blemish free skin even at home. Dried apricots help a lot in curing many lung diseases like asthma , bronchitis and tuberculosis. Powerful anti oxidants in apricot also help to fight against free radical damage and prevent from lung cancer.